AMD has decided to dissolved the ATI brand completely, and consolidated ATI brands, such as Radeon and FirePro under the AMD main brand. AMD which purchsed ATI back in 2006 for $5.4 billion point to recent research which the company says indicates that people prefer the AMD name to the ATI name. Under the new branding scheme, all of AMD's new graphics products (such as the upcoming Radeon HD 6000 series), will do away with "ATI" completely from the logo, marketing material, and so on, and the market will, as it already has been doing since the AMD-ATI merger, albeit informally, refer to Radeon/FirePro products as "AMD Radeon" and "AMD FirePro". THis move really comes as no big surprise. Most of us know the ATI name doesn’t mean a whole bunch these days, in fact most of us interchange the AMD/ATI names when referring to GPU's anyways. For me it’s more of a nostalgia thing. “Oh man, they’re phasing out the ATI name that has been here for ages!" I recently took part of in an AMD insight study where they showed off several new logo designs, some of which were for the new AMD Radeon logos some were new ATI designs. 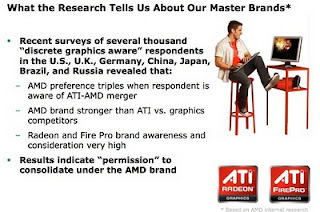 Looking back at the study it doesn’t surprise me that their research pointed to more people liking the new AMD Radeon logos over the new ATI logos they had. Those things were funky and IMO ugly.